This spectacular image of the supernova remnant Cassiopeia A is the most detailed image ever made of the remains of an exploded star. The one-million-second image shows a bright outer ring (green) ten light years in diameter that marks the location of a shock wave generated by the supernova explosion. A large jet-like structure that protrudes beyond the shock wave can be seen in the upper left. In the accompanying image, specially processed to highlight silicon ions, a counter-jet can be seen on the lower right. The bright blue fingers located near the shock wave on the lower left are composed almost purely of iron gas. This iron was produced in the central, hottest regions of the star and somehow ejected in a direction almost perpendicular to the jets. 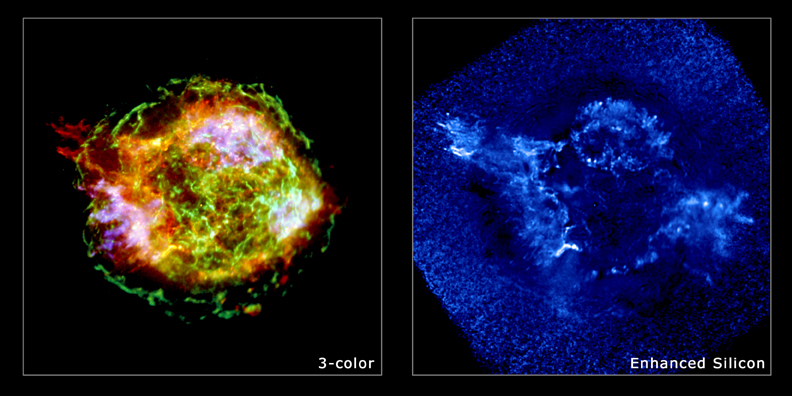 The bright source at the center of the image is presumed to be a neutron star created during the supernova. Unlike the rapidly rotating neutron stars in the Crab Nebula and Vela supernova remnants that are surrounded by dynamic magnetized clouds of electrons called pulsar wind nebulas, this neutron star is quiet, faint, and so far shows no evidence for pulsed radiation. 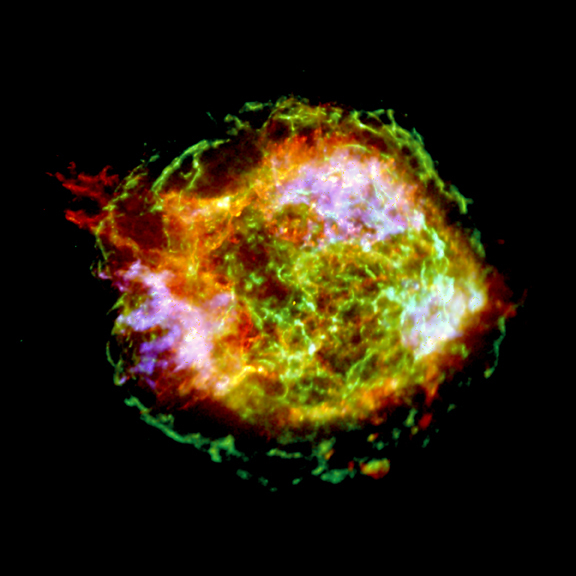 A working hypothesis is that the explosion that created Cassiopeia A produced high-speed jets similar to but less energetic than the hypernova jets thought to produce gamma-ray bursts. During the explosion, the neutron star may have developed an extremely strong magnetic field that helped to accelerate the jets. This strong magnetic field later stifled any pulsar wind activity, so the neutron star today resembles other strong-field neutron stars (a.k.a. "magnetars") in lacking a pulsar wind nebula.